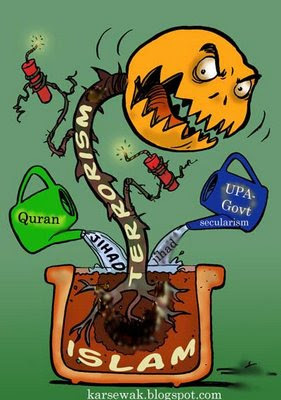 The serial bomb blasts in Bangalore and Amhedabad prove beyond an iota of doubt that the Government. has failed to curb terrorism. The reaction of the Government this time is no different than what it has been in the past, nor is it going to undergo any change in the future. The common man is now convinced that it matters little to the Government whether 10 innocent people are killed or hundreds are slaughtered. What matters to the Congress-led Government is that its minority vote bank should not feel annoyed. It is for this reason that on more than one occasion, the Government has declared that it is against bringing in any law which would put an end to the killing of innocent people. All major cities have been affected by terrorist attacks. It is the second round that has now begun with the killing of people in Bangalore and Ahmedabad. With election round the corner, terrorists will feel emboldened to carry out more such attacks. In this context, it is worth recalling an incident of an attack by a Muslim fanatic on the Commissioner of Peshawar division around 1853 and the way the British nipped the evil in the bud. While sitting in his verandah the Commissioner was listening to complaints and receiving petitions from the people. Suddenly, a Muslim fanatic delivered his petition with one hand and stabbed the Commissioner with the other. The Commissioner died after a few days. The culprit was caught and shot in an open maidan. Further, his body was burnt and not buried, as otherwise he would have been considered a martyr (shaheed) after his death. This incident is recorded by Field Marshal Roberts of Kandhar in his book An Eye Witness Account of Mutiny. This is how the British ruled India. It is now for the Indian leaders to decide. It is not the fault of the Muslims that they have always treated Hindus as kafirs. They have simply dealt with the kafirs in they have always treated Hindus as kafirs. They have simply dealt with the kafirs in the way prescribed in the Quran and Sunnah of the Prophet. If even after 600 years of slavery and Muslim rule the Hindus have not learnt any lesson then they have no right to blame Muslims. It is high time our country's leadership wakes up from its slumber and starts acting tough on terror.